The Sleeveface idea has been continually replicated in advertising with the brands in question highlighted in the blogosphere. I wrote about RFM in Paris using the Sleeveface idea in their latest outdoor campaign , Neil Perkin has had a continuing irritation over the use of the Sleeveface concept and Andy Whitlock at Now In Colour has recently gone so far as to look at a Sleeveface family tree. 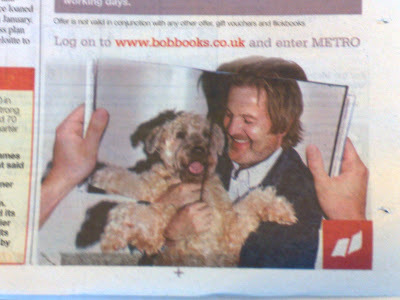 So I'm sure everyone will be pleased to see this mornings' Metro promotion for Bob Books! How much longer will this concept run? It can't be long before it turns up in ads for insurance?